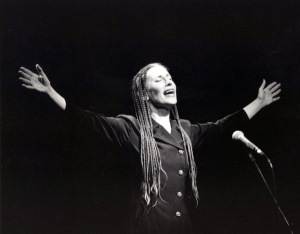 In honor of International Women’s Day 2018, here’s a look at Meredith Monk and her Songs of Ascension. Songs of Ascension is one of Meredith Monk’s creations of the past few years. If you don’t know her incomparable music yet, this is a wonderful place to start exploring it. Monk’s unclassifiable art is grounded in a unique understanding of the flexibility of the human voice. She loves to create new contexts in which to fathom its expressive depths. The result is music that sometimes sounds as if it had been quarried from an archeological dig or beamed in from a distant future. Both impressions emanate from Songs of Ascension, the tenth project Monk has recorded for ECM since her path-breaking Dolmen Music was released three decades ago. That discography charts her intrepid forays “between the cracks,” as Monk likes to put it, where different ways of perceiving the world through art converge.